It is summer, so you should ideally be spending a lot of time by a pool. 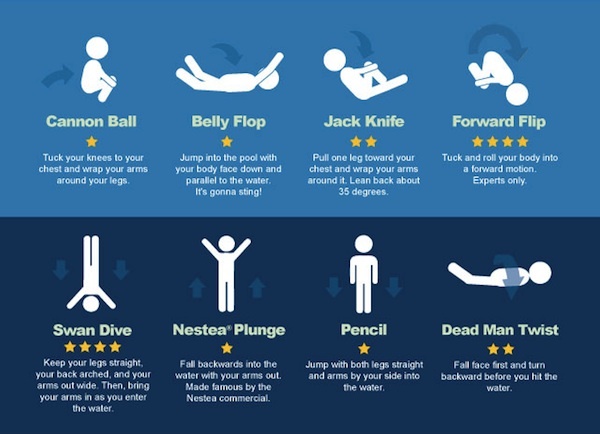 To help you make a creative entrance into the pool, pool maintenance company Swim University has made a fun infographic that details “50 Ways to Jump into a Swimming Pool”. Other than the more conventional methods like “Cannon Ball” and “Belly Flop”, they have also included creative, pop culture-inspired ones like the “Air Jordan”, “Chuck Norris” and “Harry Potter”. Each jump position is ranked on a difficulty scale of one to four stars, with one star being the simplest and four stars being the hardest—for instance, you really shouldn’t attempt the “Breakdancer” unless you are a yoga-doing gymnast who also break-dances. Read the entire infographic below.